Alexander Ediger, an outstanding Mennonite leader during the revolutionary years in Russia, was born in 1893 in the seaport city of Berdyansk where his father, Heinrich A. Ediger, was a bank manager and owner of a printing establishment. After graduating from the local Gymnasium, Alexander studied history and philology at the University of St. Petersburg for four years. After graduation he returned to South Russia and in 1919 married Kathie Dyck (24 July 1896, Telentschi, Crimea, South Russia - 1998, Kitchener, Ontario, Canada), the daughter of Jacob Dyck (b. 1853) and Sara (Reimer) Dyck (1854-1915), formerly wealthy landowners. Meanwhile the Bolshevik Revolution had reached the south of Russia and the newly married couple escaped on an icebreaker to the Crimea, where conditions were more peaceful at the time. For several years Ediger supported his young family by teaching at the Gymnasium in a suburb of Simferopol, the largest city of the Crimea. In 1922 he was chosen minister by his home congregation at Berdyansk, and in 1923 he received a call as teacher and preacher to the village of Liebenau, belonging to the Schönsee congregation in the Molotschna settlement. But as a minister he soon had to give up teaching and from then on devoted all his time and energy to his duties as preacher and elder, to which latter office he was ordained in 1925 by David H. Epp. Ediger was an earnest Christian, a man of remarkable ability, of a very friendly and amiable disposition, and of great devotion to his work. He was also a good public speaker and an outstanding musician. Not only was he a master of the piano, but he also composed music and was the leading choir director in the Molotschna. 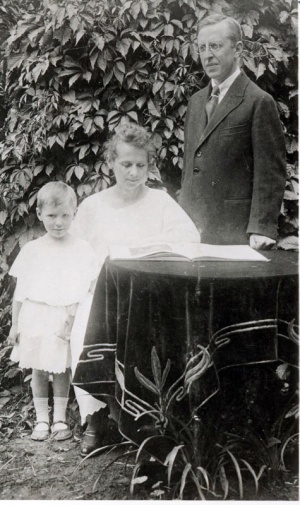 From the very beginning Ediger brought new life to the Schönsee congregation, which soon spread to other congregations of the Molotschna. In 1925 he became the chairman of the KfK (Kommission für Kirchliche Angelegenheiten) and as such had to represent the Mennonite Church before the Communist government, an exceedingly difficult task at that time. His duties led him frequently to Kharkov and Moscow, where his reception by the government officials usually was far from friendly. In 1925 Ediger also became the editor of Unser Blatt, the only Mennonite publication under Bolshevik rule. This, too, was a very difficult and dangerous undertaking in those days. From the very beginning of its existence the little magazine was censored very strictly and after three years it had to be discontinued. When religious persecution broke out, Ediger was one of the first to be arrested. In 1933 he was sent to a prison camp at Murmansk, on the shores of the White Sea in the Far North of Russia. After two and a half years he was released and returned home, only to be arrested again and sent with his wife to Eastern Siberia. Kathie Ediger was sent back to South Russia in 1938 and heard nothing of her husband after. The Edigers had two children, a daughter Dagmar, born 1922, and a son Harry, born 1926. Kathie Ediger escaped from Russia during World World War II and immigrated to Canada, but she had to leave her children in Russia. Toews, A. A. Mennonitische Märtyrer der jüngsten Vergangenheit und der Gegenwart, 2 vols. North Clearbrook, BC: Selbstverlag, 1949-1954: v. I, 73-78. Goerz, Heinrich. "Ediger, Alexander (1893-1938?)." Global Anabaptist Mennonite Encyclopedia Online. 1956. Web. 25 Apr 2019. http://gameo.org/index.php?title=Ediger,_Alexander_(1893-1938%3F)&oldid=104763. Goerz, Heinrich. (1956). Ediger, Alexander (1893-1938?). Global Anabaptist Mennonite Encyclopedia Online. Retrieved 25 April 2019, from http://gameo.org/index.php?title=Ediger,_Alexander_(1893-1938%3F)&oldid=104763. Adapted by permission of Herald Press, Harrisonburg, Virginia, from Mennonite Encyclopedia, Vol. 2, p. 148. All rights reserved. This page was last modified on 6 December 2013, at 15:53.